The best thing about summer is the fruit, so much lovely fruit. 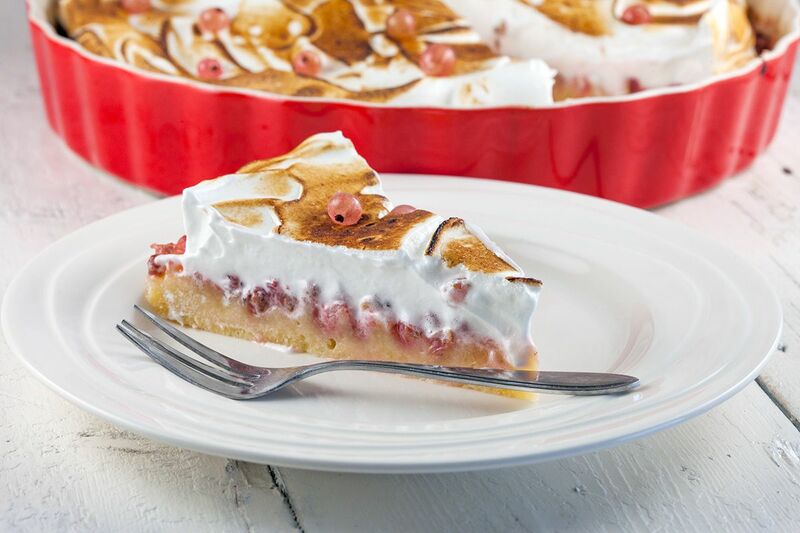 And with all that summer fruit, you can create a lovely pink currant and meringue pie! PLACE the pink currants in a colander, RINSE them and remove all the tiny pink currants from their stems. COAT the pie dish with butter and PRE-HEAT the oven to 190 degrees celsius or 375 degrees fahrenheit. CUT the 110 grams of butter into cubes and place them in the bowl of your standmixer. ADD 110 grams of sugar and mix on high-speed until you’ve reached a smooth mixture. GRATE half of the lemon and add it along with a pinch of sal t and a teaspoon of vanilla. Then ADD the eggs one by one, MIX on medium speed until the mixture is smooth again. Use a spatula to carefully fold the all-purpose flour into the batter. POUR the batter into the prepared pie dish. DIVIDE the rinsed pink currants evenly over the batter and bake in the oven for about 30 minutes. You can check if the pie is ready with a wooden toothpick or skewer, if it comes out clean, the pie is done. Let it cool off just enough the meringue won’t ‘melt’. DEGREASE the bowl and whisk of your standmixer. The most easy way to do is, is using a paper kitchen towel and a few drops of lemon juice. ADD the egg whites and beat them until they form soft peaks. 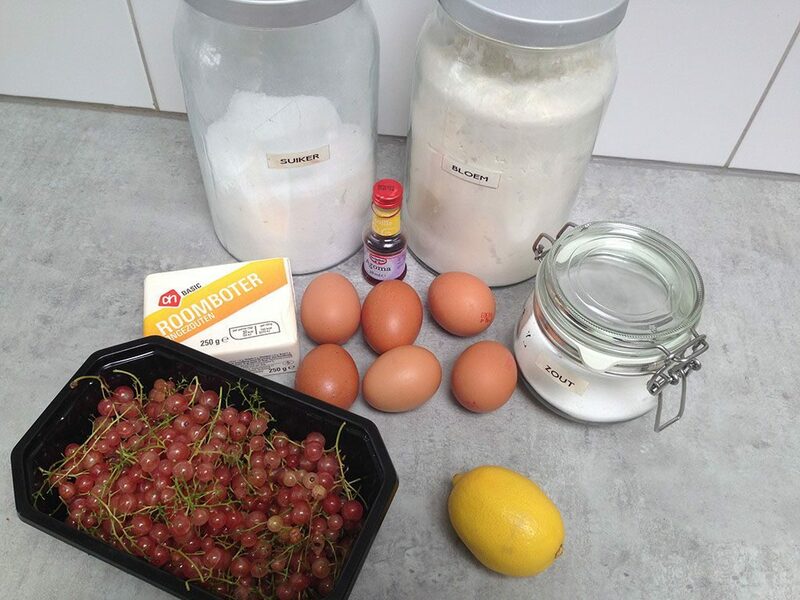 Gradually ADD 150 grams of sugar and keep on mixing on high-speed. ADD the rest of the lemon zest and lemon juice. When the egg whites are ready, that’s when they form stiff peaks, DIVIDE over the pink currant pie. 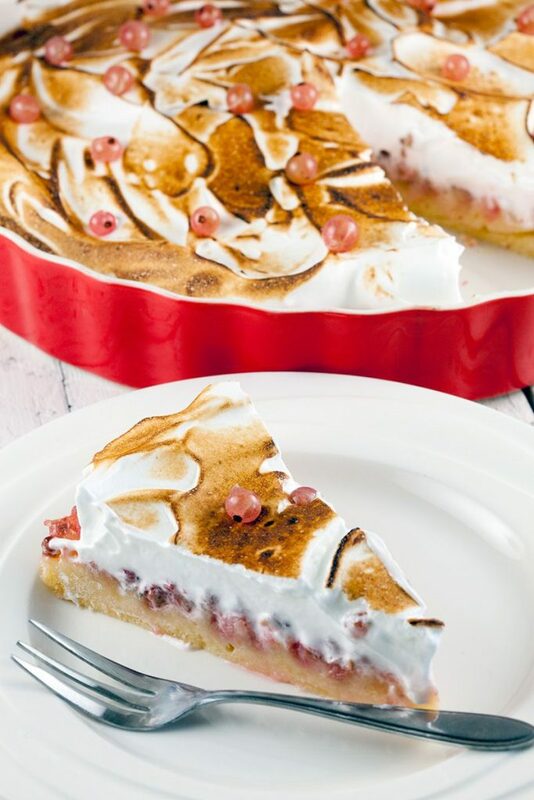 USE a creme brulee torch to caramelize the top and garnish with some more pink currants if you like. 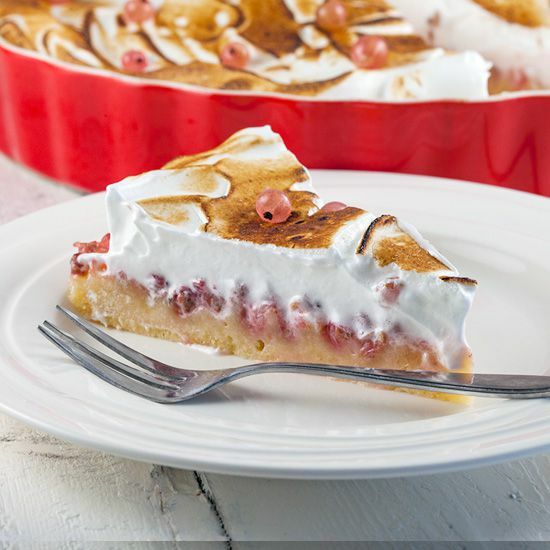 This pie is best when it’s freshly made, that’s because after a few days the meringue can collapse. Enjoy!